Last week was the final week of the fruit share for the season from my CSA. Bless them… for a good portion of the fruit share I received apples and pears. So much so – that I just could not eat them fast enough. 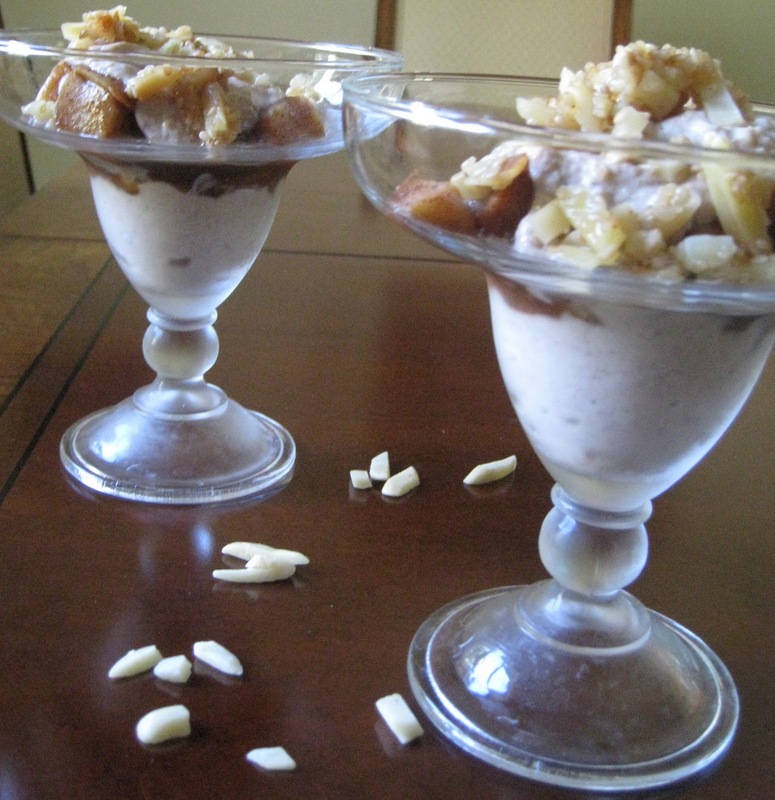 I decided that the best use for the pears was a spiced pear parfait. I spiced up the pears with a bit of cinnamon, nutmeg and cardamom- scented them with vanilla and added some golden raisins to it. The combination of golden raisins and cardamom are classic combinations along the Silk Road- adding just a bit of bite to the sweet moist plump raisins. Then I made some tofu cream- for all those out there that are vegan or avoiding dairy all together. 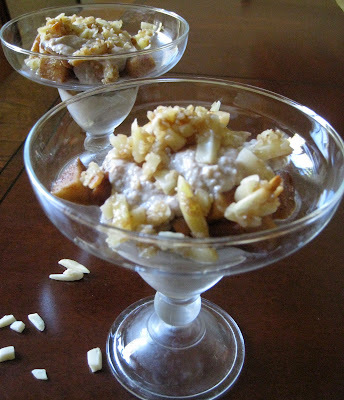 I spiced up Silken Tofu with vanilla and blanched almonds. To top off this creamy Sunday, I made a sweet and salty almond crunch. A beautiful presentation in a glass with layers of golden pears and lightly colored cream laced with cinnamon. Whip some up in the fall when pears are at their peak. Thanks to Amy from the FragrantVanilla Cake for sharing this recipe and inspiring me to recreate desserts into healthier wholesome delights. 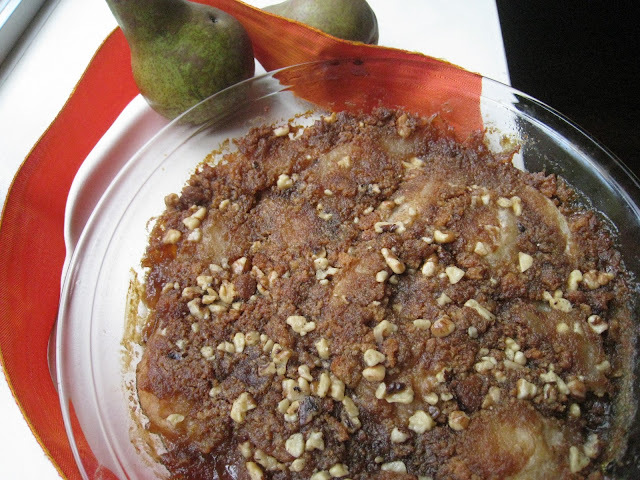 1 Place pears in a skillet over medium heat and combine with sugar, raisins, lemon juice, cinnamon, cardamom and nutmeg. Stir occasionally so that the pears don’t stick to the skillet. Cook for 5 minutes or until pears have softened. Remove from heat and add vanilla extract, and salt. Let mixture cool completely then place in the refrigerator until cold. 2 To make cream: In a food processor, combine tofu, maple syrup, almonds, sesame seeds, vanilla extract, almond extract, cinnamon, lemon juice and salt and process until very smooth. Place in the fridge to chill until very cold before assembling parfaits. 3 To make nut topping: preheat oven to 375°F. Line a baking sheet with foil, and spray with non-stick spray. Toss almonds, sesame seeds, maple syrup and salt until well combined. Spread out on prepared sheet, and bake for 7 minutes until seeds are fragrant and toasted. Remove pan from oven and let cool completely. 4 To assemble: line up 4 (8 ounce glasses). Place a third of the cream in the bottom of each, dividing evenly between the three. Top with half the pear mixture, dividing evenly between the three, then half the remaining cream, then the rest of the pears, then the last of the cream. Top with the almond sesame mixture. Serve immediately. I make this crumble most often once when the fruits of summer give way to apples and pears in the fall. Crumbles are easier to prepare and faster to bake than pies, crisps and cobblers and are the perfect showcase for seasonal fruits. This dessert is the simplest of all: fresh pears are covered with a ginger snap topping and baked until the crust is crispy and the filling bubbles and thickens. Gingersnap cookie crumbs is the base for this sweet, nut-filled crumble that tops this pear crisp. 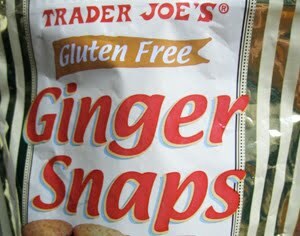 I used Trader Joe’s Gluten Free Ginger Snap cookies, however feel free to use any other brand of your choice. Serve with light cream or a scoop of vanilla yoghurt. Place pears, cut side up in a 9-inch pie pan. Drizzle orange juice over pears. In a medium bowl, combine ginger snaps, sugar, walnuts and butter. With your hands work it until it looks something like mortar. Pat ginger snap mixture over the pears. Bake in preheated oven for 20-25 minutes.